Before: Patient missing 2 Upper lateral incisor teeth (in area of spacing) and previously wore a removavle partial denture (or flipper) to cover area of missing teeth. After: Smile, bite, and chewing restored with 2 Single Implants & 2 Single All Porcelain Crowns that fit securely over the implants. 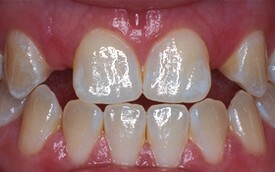 The color of the crowns was matched to adjacent and lower teeth. 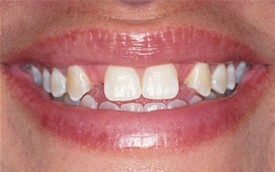 The patient no longer has to wear a removable partial denture appliance and can smile with confidence.